The American Conservative Union issued its "Ignorant Camp Followers" "Defenders of Liberty" award to Republicans in the NC General Assembly, based on how their ALEC-addled drones voted on 12 bills, and House Speaker Thom Tillis, without whose iron grip on the flow of legislation none of the 12 bills would have passed, did not make the cut. He missed voting on two of the 12 bills, and that's a serious -- and serendipitously happy -- no-no to the American Conservative Union. 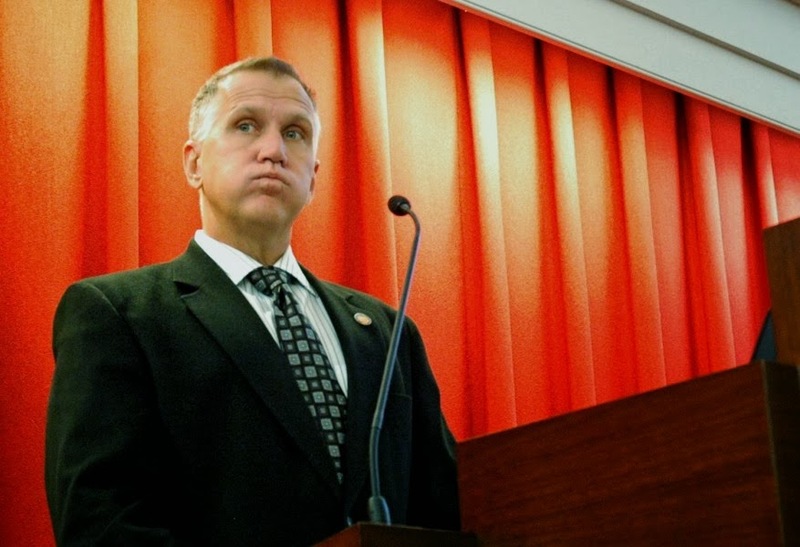 How cool was it to be able to deny recognition to Tillis on a technicality! Poor Thom Tillis! Dissed once again by conservatives, who owe him everything, really, but who don't trust his sucking up to the country club elite. $$ against Hagan. She is of course trying hard to move away from Obama on virtually everything so it will be bewildering ideologically to watch the fall race shape up. Outcome will hinge totally on turn-out, and thank goodness there's a push by Democracy NC called Operation Jumpstart to inform voters about the new voter suppression laws and how to get yourself registered and vote in November. Friends don't let friends vote Republican!